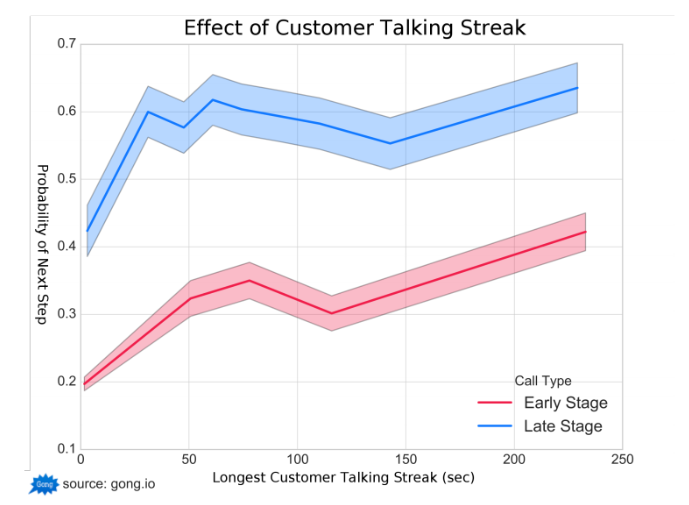 Industry Insights Report: What Behaviors Lead to Successful Sales Calls? A recent study analyzed over 70,000 B2B SaaS sales calls. In this post, we break down the data and discuss behaviors that can make you more successful. 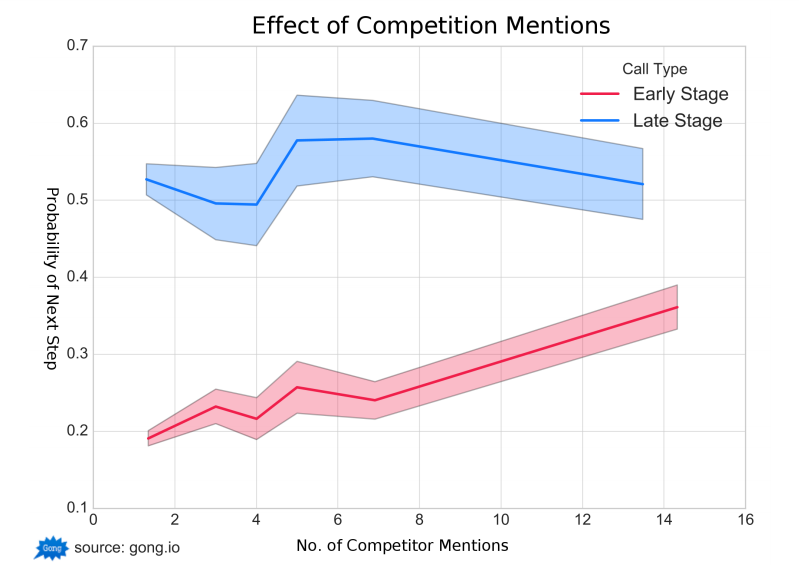 The data science team at Gong.io recently teamed up with Startup Sales Bootcamp’s Juliana Crispo to analyze over 70,000 B2B SaaS sales calls. “To my knowledge this is the largest sales study of its kind to date,” says Crispo. The goal of the study was to reveal similarities among successful calls, with success defined as moving the sale one step closer to the close, be it a demo, a proposal, or an actual close. While some of the findings fall into the “tell me something I don’t know” category, the sheer strength of the data underscores the role certain behaviors play in achieving results. Here are three behaviors sales reps and leaders should pay particularly close attention to. 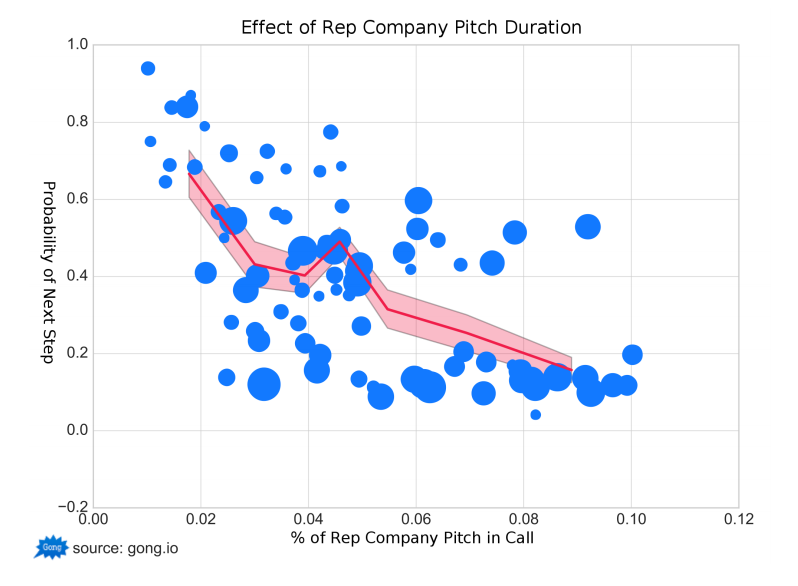 Crispo calls this “the case for a 2-minute pitch cliff” because if you pitch your company for more than two minutes, the odds of a successful outcome drop significantly. While this advice doesn’t deviate from the “listen more than you talk” mantra we’ve been taught since day one, it does show that we need to be especially mindful when it comes to talking about ourselves. Sometimes when a prospect asks us a question about our company or offers up a subtle compliment, we take it as permission to extend our pitch. The data says this is a mistake. Rather, we need to know our pitches inside out so that we can fit the right messages in from multiple conversation points, get out, and steer the conversation back to the prospect’s business needs. The goal is to make the prospects feel understood. Not to make them feel like we asked enough questions to balance out our talking. This data shows that when prospects get an opportunity to explain themselves without interruption, they tend to take the next step with us. For sales leaders, the challenge is to eliminate the “limiting belief,” as Crispo calls it, that sales reps are a) being intrusive, or b) exposing their inexperience when they ask prospects to further clarify their problems. It’s not uncommon for sales reps to tense up when a prospect brings up competitors. In reality, though, the data says you should be concerned if the prospect doesn’t bring up competitors early in the process. Your prospect can find five competitors with few keystrokes, and it’s likely they already have. It’s unreasonable (and dangerous) to think that you can skate through the sales process without dealing with competition. After all, if you’re not shaping the decision-making criteria, your competition probably is. Which helps to explain why saving conversations about competition until later in the sales process leads to a lower probability of success. Sales leaders need to help their teams proactively broach the topic of competition early in the sales cycle, while also preparing their teams to tactfully discuss individual competitors. In other words, there’s no reason not to be prepared for these conversations. No matter how strongly our intuition tells us there are right and wrong behaviors, it’s nice to have validation via cold, hard data. Use the results of this study to reinforce positive behaviors among your team. Is your intuition telling you that it would be nice to have posts like this show up in your inbox? 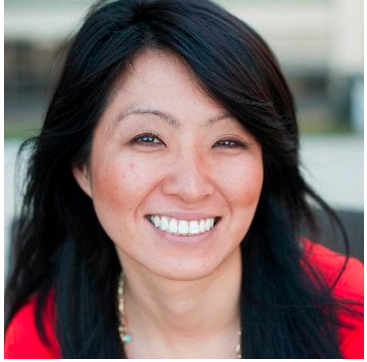 Listen to it: Subscribe to the LinkedIn Sales Solutions blog.